1. We match your skills and specific areas of development to enriching roles within one of our established host companies. The expansive network of host companies we work with allow us to provide our interns with stimulating and exciting roles in their chosen sectors of interest that are suited to their strengths and the skills they want to develop. 2. We provide you with support, mentoring and training throughout your internship experience, including remote working skills and employability coaching. Training and coaching are provided before and during the internship so that you gain the necessary skills needed to be effective from the get-go, and maintain continuous improvements to your skill set throughout the course of the internship. The modern workplace is becoming increasingly remote, put yourself at the top of an employer’s shortlist by developing your remote working skills and IT competencies. 3. References and in-depth feedback from your internship experience once you have finished to make your CV shine! After you have finished your placement with your company, you receive a reference from them as well as a detailed transcript from us of the skills you’ve developed and tasks you’ve performed throughout the programme. These documents can make your CV stand out from the crowd and show evidence of your development and experience. Our alumni find these aspects are a fantastic springboard to their future career and massively boost their chances of securing a role in their chosen career paths. Why Virtual? 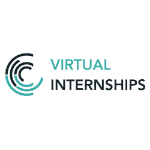 A flexible, cost effective internship development programme without the travel and living costs! Living and travel expenses for internships are on the rise, and can get very pricy; The expenses of an internship in Sydney could cost you nearly A$2000 a month! Our programme provides a fantastic alternative that lets candidates get real world experience and tailored coaching and support from the comfort of their own homes. The total price for the programme is A$1195, which lasts between 2 and 6 months, and has the advantage of being flexible, since the internship can be done alongside other commitments such as work and studies, to a schedule that suits you.